Shields was born to Jerry and Martha Shields in Jacksonville, Florida in 1982. Shields competed professionally as a vert inline skater. He participated in the 1999 and 2000 X Games and toured with Tony Hawk in 2003.Shields directed an inline skate video titled .W.A.R. starring Chris Haffey. His work often involves images of violence and splattered blood. He collected blood from 20 celebrities to make a piece of art for his Life Is Not a Fairytale exhibit in Los Angeles and also photographed Lindsay Lohan as a vampire for that exhibit. In 2010, Shields photographed actress Lindsay Lohan in studio portraits brandishing a gun. Shields also appeared to stage the “shooting” a partygoer with a gun that year at the release party for his book Collisions, as an appropriated piece of performance art en homage to the cans of Fluxus artist Piero Manzoni and in imitation of 70s Los Angeles performance artist John Duncan along with a student in the department of New Genres at UCLA in the 1990s (among others). In 2012, Shields released a photograph of his then-girlfriend Francesca Eastwood burning, sawing, and biting an alleged $100,000 Hermès Birkin Bag for a photoshoot. The public responded badly due to the $100,000 that the bag was purchased for just to be destroyed. On 12 November 2013 Shields released his photography book The Dirty Side of Glamour through Harper Collins and IT books, which features Emma Roberts, Brittany Snow, and others. During an Auction at the Phillips Auction house in London, on November 18th 2014 for an auction titled “PHOTOGRAPHS” Tyler Shields work “Kodak” was featured along side Helmut Newton, Richard Avedon, Irving Penn, Horst P. Horst and William Eggelstone. Historical Fiction by Justin Jones A white man dressed as a traditional Klu Klux Klan member is hanged by a black man. Tyler Shields, photographer by Justin Jones Tyler Shields is not one to shy away from controversy. Previous works, like setting fire to a $100,000 Birkin bag and giving actress Heather Morris a black eye, have enraged advocate groups while his provocative images of young Hollywood has titillated the masses. But “celebrity photography is dead,” Shields told The Daily Beast, so he’s setting his sights on a highbrow reputation and it begins with tackling America’s race problem. His recent series Historical Fiction, which opens May 16th at Andrew Weiss Gallery in Santa Monica, California, focuses on powerful interpretations—and alterations—of impactful moments in history. “Right now we are going through a real racial issue in our country,” Shields said. “These type of images speak from the 1920s to now,” Shields said. “This could literally be yesterday in Baltimore or Georgia in 1965,” if the black man was the oppressed instead of the white. It could even be the 90s with events surrounding Rodney King. 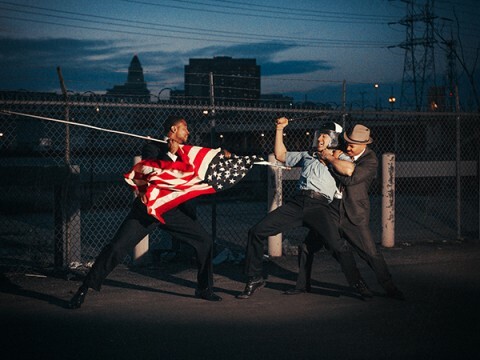 “And there’s just something so powerful about using the American flag as a weapon.” And while he’s sure to have people talking with his new photos, flip through our gallery to see some of his past works. Historical Fiction by Justin Jones A white cop is pinned down by two black men. After all, the connection between the KKK, who refused to comment on the images, and lynching is heavily engrained in the fabric of its identity in American history. And that’s what Historical Fiction, which opens May 16 at Andrew Weiss Galleryin Santa Monica, California, is all about: powerful interpretations—and alterations—of impactful moments in history. Soon he realized that the same applied for the moment JFK was killed, Marilyn Monroe died, or Martin Luther King, Jr. was assassinated. So, he tracked down artifacts (JFK’s toe tag, Marilyn Monroe’s pill bottles and a PanAm plane), vintage clothing and actual newspapers to photograph staged reactions to these now-historical events. In one image, a row of perfectly primped white suburban housewives sit under massive 60s-style hair dryers reading the daily paper. The front page tells of Marilyn Monroe’s death as shock and horror fills their faces. For the image inspired by Martin Luther King, Jr., a group of black women mirror the poses of the Monroe image, but their emotions are much more visceral. They look more than stunned as tears stream down their faces; the image no longer looks like a recreation. Even in 1976, almost a decade after King was assassinated, his work to bring racial equality was far from finished—chaos was still taking over major cities due to desegregation. A Pulitzer Prize-winning image by Boston Herald American photographer Stanley Forman captured a white teenager attempting to assault a black lawyer and civil-rights activist during protests against desegregating the city’s buses. His weapon of choice: an American flag. In The Soiling of Old Glory, it seems as though another white man is holding the arms of Ted Landsmark, the activist, while Joseph Rakes times aim at stabbing Landsmark with the pole. It immediately became an iconic image, though the facts of the day reveal that the man behind Landsmark was a friend helping him to his feet and Rakes wasn’t spearing the flag, he was swinging it. Shields has recreated this image with a twist. In it, a black man holds a white cop wielding a baton back as another black man takes aim with an American flag. It’s not an exact recreation, and the addition of a uniformed cop updates the iconic image into one that could conceivably be seen on the streets today. The tension between white cops and black suspects has reached an all-time high, most recently visible on the streets of Baltimore. The murders of numerous blacks, by citizens and police, over the past few years have reignited a long-standing cultural race issue within American society. The deaths of Trayvon Martin, Michael Brown, Eric Garner and Freddie Gray have sparked riots, and anguished debate. Another of Shields’ images is of a white cop being pinned down by a group of black men in suits. Shields has never been one to shy away from controversy. Previous works have often sparked public outrage and the occasional death threat. In 2012, Shields caused uproar for setting fire to a $100,000 alligator skin Hermes “Birkin” bag. And in 2011 domestic abuse groups were furious when he photographed actress Heather Morris bound and sporting a black eye. He calmed both rows by donating money to charity. He’s been photographing young Hollywood—many of whom are his friends—for years (Emma Roberts, Zachary Quinto, and Lindsay Lohan among others), mostly in death-defying or sexual provocative situations. But, they’re only a small part of his oeuvre and he’s looking to leave (as one of his show title’s had it) the Dirty Side of Glamour behind to make a name for himself as a high-end artist. “Celebrity photography is dead. It’s over,” Shields said. Everything is highly airbrushed and if you want an intimate peek into the life of a celebrity, all you have to do is find their Instagram. Shields, who is originally from Jacksonville, Florida, has no formal training in photography and, instead, started his career as a competitive inline skater (he toured with Tony Hawk) and videographer. Saturday will be 11 years since he shot his first professional photograph, an empty closet with two pairs of shoes and hanger. An ex-girlfriend who cheated on him with a photographer inspired it. He sold that image at his first show for $75 to a fan from MySpace. Since then he has created series involving actors and models suspended in air, submerged under water, and in compromising positions. But he’s spent the past two years focusing on high-end art and getting his works into galleries and museums, as well as publishing books. Last year, he was in a Phillips Auction with iconic photographers Helmut Newton and Irving Penn. Collectors have started to take notice. Bruce Halpryn, the first person to purchase Shields’s recent lynching photo—long before its gallery debut—also avidly collects Richard Avedon and Herb Ritz. He’s notorious for purchasing soon-to-be iconic images and made a special trip to Los Angeles to see the photo in person. He purchased the print, which is limited to three, it on the spot.